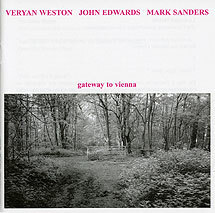 Veryan Weston, piano; John Edwards, double bass; Mark Sanders, percussion. Disc A recorded at Gateway Studios, London on 19 December 2003; disc B recorded at Porgy & Bess, Wien on 10 May 2002. Front cover photograph (reproduced above) by Veryan Weston.